Embarrassing, and probably somewhat painful for the person driving if they weren’t strapped in properly. I imagine that falling on its side is probably nothing for a tank though, considering they are made to withstand a lot more than that. They probably just rammed something into it to prop it back up, dusted it off, and attempted to load it again. I think they are going to need some more white paint (what is up with a white tank in the desert, anywise?). What was his guide doing? Looks like a UN tank. If so I am pretty sure that was a standard maneuver for them. It’s called the Tank Surrender and the video was just one of their drills. I’m pretty confident that’s not a tank. Crap. I have no idea how to tell the difference. Stupidly, I just went by the video title. Calling that a tank is like calling a magazine a clip. Similar but not the same. Damn it, I knew that was going to happen to me sooner or later! I don’t know military vehicles at all so I just went by the title. Don’t feel too bad the thing has tracks and a big gun that turns around. It is much more similar to a tank than a clip is to a magazine. In fact, I believe the only reason this vehicle can not technically be called a tank is because it lacks a “shoulder thing that goes up”. 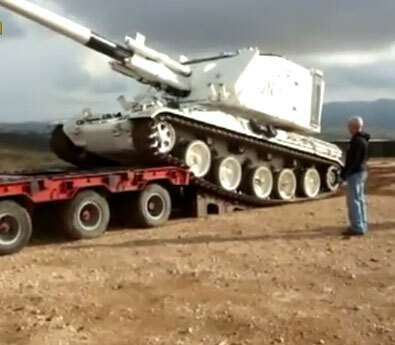 Yeah, I was going to say the same, looks like a UN self-propelled artillery piece. But seeing that they really don’t fire them much, just move them around to look like they are keeping the peace, no harm no foul. If it has a single-shot main gun designed to penetrate armor at long range through direct fire, thick armor (especially in the front), and tracks, it’s probably a tank. The French just love that Surrender White don’t they? Are we sure this wasn’t a new “Maintenance” tactic?